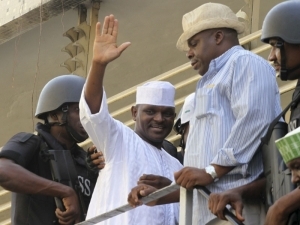 The January 30, 2012 death sentence slammed on Hamza Al Mustapha and Lateef Shofolahan by a Lagos High Court finally brought the protracted trial of the former Chief Security Officer to Nigeria’s ex-maximum ruler, Sani Abacha and the personal aide to late Kudirat Abiola to an inglorious end. Widely acclaimed as a victory for the rule of law and validation of the revered principle of ubi jus ubi remedium (where there is a wrong, there is remedy), the judgment by Justice Mojisola Dada, placed a firm lid on the pot pourri of dilatory tactics, theatrical displays, and legal fireworks that coloured the 15 year-long tortuous legal battle for justice over the murder of Alhaja Kudirat Abiola. The passage of time has seen significant changes in the legal, social and political landscape, the emergence of new issues and social contradictions, and the reconfiguration and transfor¬mation of the active social, legal and human forces. This protracted nature of the trial has regrettably, been misconstrued in some quarters, as a fundamental breach or degrading treatment of such a scale and character that qualify the accused persons to be discharged or even acquitted. In my view, this argument is blatantly flawed and laughable considering the fact that the guilt of an accused person is not purged by reason of effluxion of time. Under section 316 of the Criminal Code Act CAP C38, LFN 2004, taking away another person’s life in circumstances which are not authorized, justified or excused by law are expressly prohibited. As was incontrovertibly established by the prosecution during the trial, subsections 1 and 2 of that law requires that mere proof of intent to kill or cause grievous bodily harm is sufficient. In the English case of Hyam Vs. DPP (1974)2 AER 41, the House of Lords held that an intention to cause death or grievous bodily harm is established “if it is proved that the accused deliberately and intentionally did an act knowing that it was highly probable that it would result in the grievous bodily harm to the victim, even though he did not desire that result”. Hamza’s role in providing guns used for the deadly operation, and Shofolahan’s treacherous provision of intelligence that enabled the killer squad to effectively track and kill the late wife of the winner of the June 12, 1993 presidential election, Chief MKO Abiola were upheld by the court as sufficient evidence of intent to kill, which is a basic ingredient for the establishment of the crime of murder. As a young law school intern, then assigned to Justice Olubunmi Oyewole’s Court, I witnessed firsthand, how the defense attorneys employed every known dilatory tactic and wacky technicalities to frustrate the expeditious hearing of the case. We were then required to take copious notes of the often annoying proceedings in the celebrated trial. Without restraint, counsel to Hamza Mustapha, Olalekan Ojo Esq. lavishly hurled abuses at the trial judge, and quite routinely, used despicable language to address the court. Plethora of judicial authorities and tons of literature on criminal jurisprudence were often cited to support a single legal argument or motion, causing serious holdups in the progression of trial. Ostensibly irked by the unnecessary dramas and delays in the trial, it wasn’t surprising when General Bamaiyi and the other co-accused persons requested for a separate trial. In fact, it’s an aberration for the same party responsible for the delay to rely on his inactions as an excuse to escape punishment. As Hafsat Costello-Abiola, the eldest daughter of the late Kudirat Abiola rightly stated, the verdict handed down by the Lagos Court serves as a notice that justice delayed is not justice denied. It also affirms and increases public confidence in the judiciary as the last bastion of hope for the common man. With the latest appeal by the condemned persons challenging the High Court’s verdict before the appellate court, this might just be the beginning of another legal sojourn through the corridors of judicial gymnasium. The long wait for justice continues!